Although there were no famous Hollywood actors or 3d visual effects, the Carlisle recently staged one of the most accurate and beautiful depictions of the sinking of the Titanic ever. The grounds of the city’s castle provided the eerie serenity of the night sky as the rendition of the sinking of the doomed vessel took place. The event involved torrents of water and plenty of ambient lighting to create one of the most disturbingly accurate yet beautiful depictions of the Titanic sinking ever captured. The re-creation took place at an amphitheater packed to capacity. 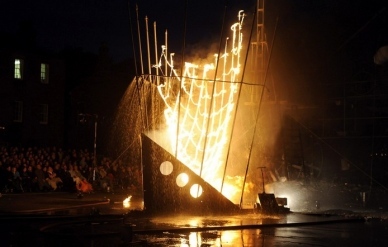 One of the latest and largest open-air events to ever be staged in Cumbria, the event was an accurate and movie depiction of the triumph and tragedy that was the Titanic. The drama began with engineers constructing the ship, re-creating its glory and majesty, and ending with the sinking of the Titanic. The entire production rounded out at 70 minutes and came complete with lights, noise, and music to instill the full effect within the crowd. Both last Friday’s and Saturday’s shows were sold out and the event was performed in front of 650 people each time. The castle grounds had been flooded with Titanic enthusiasts since just before 9pm and found the grounds taken over by a representation of the massive bow of the legendary Titanic. The re-creation of the sinking of the Titanic was performed by the Theater Titanick group from Germany. The finale of the sinking of the Titanic involved plenty of lights and sound shooting from the wreck. Jets of water streamed off below the feet of the audience and the climax of the sinking of the Titanic was no less than epic. Continuing to tour in the Cumbria area, the event is looking to make the most of the country’s assets and educate individuals on the legendary Titanic and its place in history. 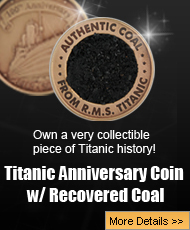 This event marks one of the only and certainly the most epic re-creation of the sinking of the Titanic ever as well as depicting Titanic survivors who made it out alive to tell the story.